For business owners who want to minimize the risk of asset damage, and liability due to potential off-site releases, in flood-prone areas, flood control should be a top priority. Water-filled flood barriers can help prevent flood damage on industrial and commercial sites when used alongside other flood control measures. The AquaDam is a patented water-filled flood barrier composed of two watertight tubes contained within a woven baffled outer sleeve. The vertical baffle skirt that runs down the length of the centerline of the AquaDam increases stability of the unit, especially during installation. When expensive or irreplaceable infrastructure, equipment, and buildings are at risk, the AquaDam can be deployed in hours, wherever needed. 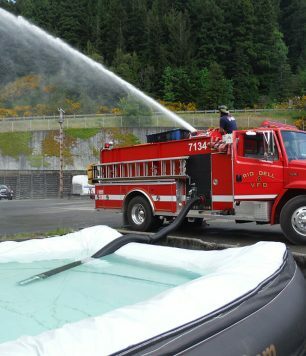 When used appropriately, the AquaDam is a quick-to-deploy, effective water-filled solution for perimeter flood control. Industrial sites typically hold thousands or millions of dollars in products, supplies and other company assets. Just one flood event can deplete many of these resources and cost businesses of any size a significant amount of time and money to recover. Easy access to water is essential for many industrial processes, resulting in many river-side plant locations. AquaDams can aid in efforts to avoid flood damage and protect company assets. Facility managers can store, deploy, and recover AquaDams to provide expedient, temporary flood control in a joint effort with other aspects of the flood control plan. AquaDam water-filled flood barriers are readily available. An extensive inventory, including more than 25 miles of length for the most commonly required AquaDam heights, is ready to go on demand for nearly any commercial flood barrier application. Further, after the purchase of these barriers, they can be quickly used on-site. 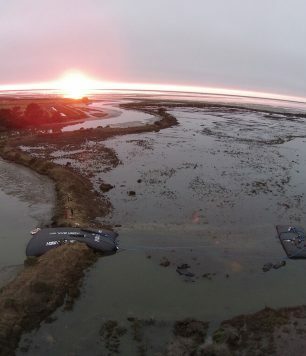 Unlike sandbag barriers, thousands of feet of AquaDam can be deployed and filled in a single day with the labor of only (2) people, and (2) pumps. 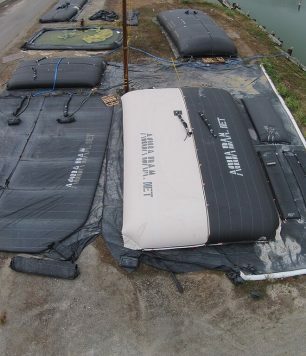 AquaDams are installed much more rapidly than sandbags or other traditional options. AquaDam users report significant savings on barrier construction and removal labor expenses as well as the initial cost of purchase. 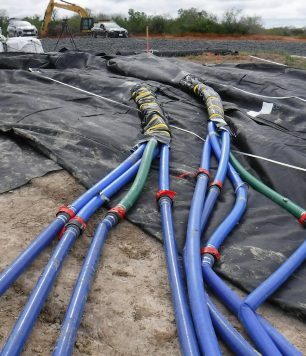 After the threat of flooding is gone, the AquaDam can be drained and rolled up for convenient storage on site, or at one of our storage locations. These flood barriers are often reusable in the event of another flood, but reuse is not guaranteed and is based on numerous factors. Care must be taken to ensure that each barrier’s capabilities remain intact. AquaDams should be inspected, and possibly repaired, after each deployment and recovery. Nuclear Power Station Isolation, 5ft water depth, Blair, NE: In June 2011, Omaha Public Power District, with the help of FEMA, purchased AquaDams to provide perimeter flood control at the Fort Calhoun power generation plant, which was threatened by the flooding Missouri River. More than 5,000ft of 8ft tall AquaDams surrounded and isolated the reactor buildings and other critical infrastructure, including five other buildings and structures. 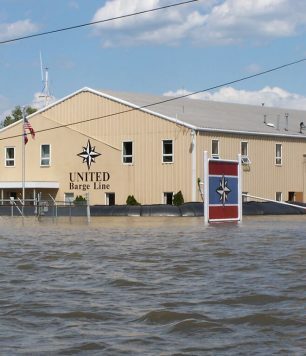 Barge Equipment Building Isolation, 4ft water depth, Metropolis, IL: In 2011, United Barge Line used 600ft of 5ft tall AquaDams to control flooding at a major equipment storage building located near the Ohio River. The AquaDams were deployed in a full circle around the protected area, including the building and a small patch of ground on all sides. These dams prevented multi-million dollar losses from uncontrolled flood damage. Learn more about how you can use AquaDam water barriers as part of your flood control plan at your industrial or commercial site. Contact AquaDam online or call 800-682-9283 for more information or to request a quote.